In this post, learn everything you need to know to fly in the Dominican Republic with your drone! Drone flights in the Dominican Republic require approval from the Instituto Dominicano de Aviacion Civil (IDAC) as soon as the copter reaches a weight of at least 2 kilograms. The application will be issued within 25 working days and can be transmitted electronically (DTAC@idac.gov.do). Maximum Altitude: The maximum permitted ascent altitude is 120 feet (400 feet) in the Dominican Republic. Maximum horizontal distance and FPV: Drones must always be operated within sight. Specifically, this means that the multicopter cannot go more than 455 meters (1,500 feet) away from you. Compulsory insurance: For the use of drones in the Dominican Republic, you need special liability insurance. Maximum take-off weight (MTOW): From a take-off weight of 2 kilograms you need a permit from the IDAC and you have to pay attention to additional requirements. Distance to airports: Flight lanes and airports must be at a distance of 8 kilometers (5 miles). Other safety distances: For buildings, vehicles, and people, a distance of 50 meters must be ensured. Operating Times: Drones may only be flown between sunrise and sunset. Special features: Drones weighing less than 2 kilograms must not fly faster than 30 knots (55 km / h). Requirements for commercial pilots: In my understanding, drone operations in the Dominican Republic are classified primarily by weight and not by type of use. Good to know: According to forum reports, police and army members may question you about your drone flights. However, this is probably due to the curiosity of the locals, so you do not have to be afraid. Nevertheless, you should, of course, be careful and follow the rules. 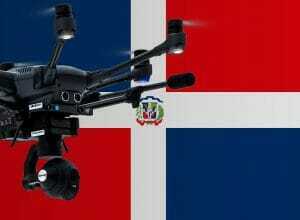 We have researched the listed drone regulations for the Dominican Republic to the best of our knowledge. We cannot guarantee the correctness of the information. If you want to be on the safe side, contact the competent aviation authority. Alternatively, you can also ask the embassy in your country for further information about the regulations. Please leave us a comment when you receive news and/or gain experience with your copter in the Dominican Republic! Did you have any bad experiences with flying in Dominican republic? I’m traveling to Dominican Republic in about 2 weeks with go pro karma it weights little less then 2 kg do you think i need that permit? no, you do not need the permission. Enjoy the country! I’m taking my DJI Mavic Pro, do I need a permit?? As far as I know, you don’t need a permission since your drone weights less than 2 kg. Hi, I am also taking my Mavic Pro to Dominican republic in February. I was wondering if you had any issues that I might need to know? Hi All, did you run into any trouble with you Mavic Pro in the Dominican? I’m leaving in 2 weeks an someone told me you need a permit now, even for recreational use.